Concord, N.C., – Kyle Busch got another “1” by his name in the record book on Friday at Lowe’s Motor Speedway. When qualifying for tonight’s Camping World Truck Series race, the North Carolina Education Lottery 200, was rained out after 21 of 39 entrants had run against the clock, he inherited the pole based on his team owner Billy Ballew’s position in the standings. Mike Skinner and Ron Hornaday Jr., who will start second and third respectively, were first and second, respectively, when the rains came. Todd Bodine and Matt Crafton complete the top five. Missing the field were Wayne Edwards, John Wes Townley and Andy Ponstein. 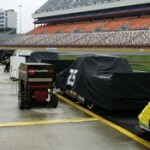 The starting field will be made up of 15 Chevrolets, 12 Toyotas, six Fords and three Dodges.